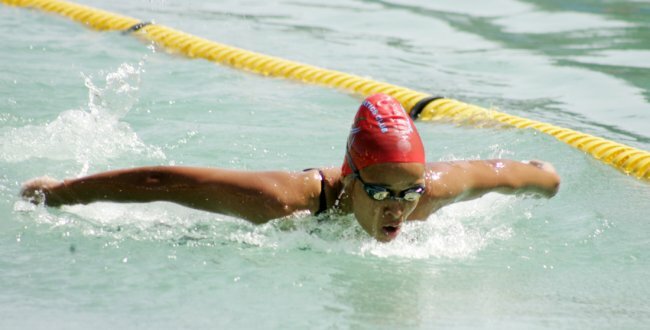 Emily Muteti, 16 from Mombasa Aquatics Club broke a 10-year old record as the three-day National Age Groups, Open and Relays Swimming competition started at the enters Kasarani swimming pool on Friday. She set the new record in the girls’ 400 metres Individual Medley Long-Course clocking 5:37.06 minutes which was inside the 5:47.65 by Achieng-Ajullu Bushell in 2006 in South Africa. After finishing, Muteti had enough time to pose and look over her shoulder as Andala Mukulo came second on 6:28.62 with Menina Nightingale third clocking 6:36.22. As if this was not enough, Muteti then assaulted the 200 metres Long-Course butterfly event where again broke Ajulu-Bushell’s old time of 2:43.90 in a new time of 2:39.02. Her searing speed was enough motivation for Nasimiyu Khatund of Kenya High who was timed at 2:41.24. More records could be under threat when the competition resumes on Saturday with some of the slightly over 500 swimmers enjoying perfect swimming conditions. Also sharing the limelight on the opening day was Muhammad Bilal Khandwalla from the Blue Ocean Swimming Club, Maahir Harunani and Karan Khangram. Girls: Virginia Okumu (Braeburn) 20:40.34, Chantelle Kariuki (Sea Hawks) 20:46.58, Nabala Shikely (Mombasa Aquatic) 20:52.82. Boys: Nuwa Senkebe Serunjogi (Seals) 10:33.28, Karan Khangram (Mombasa Aquatic) 20:35.38, Mohammed Suleiman (Mombasa Aquatic) 20:39.63. Girls: Emily Muteti (Mombasa Aquatic) 5:37.07, Adala Nyamoita Makhulo (Unattached) 6:28.62, Menina Nightingale (Kenton) 6:36.22. Boys: Maahir Harunani (Mombasa Aquatis) 5:37.37, Shaan Vora (Mombasa Aquatic) 5:48.64, Billy Muteti (Mombasa Aquatic) 5:58.12. Girls: Emily Muteti (Mombasa Aquatic) 2:39.02, Nasimiyu Khatundi 2:41.22), Riva Kana (Mombasa Aquatic) 3:11.53.